Three vamp parts are layered on each other in this innovative improvisation collection, allowing soloists to join in as they please. Some vamps are simple, others more challenging. Improvising becomes accessible with soloing guidelines and tips. 35 different styles are covered, including jazz, classical, hip-hop, rock, country-western, Asian, African, Celtic, Latin, Gregorian and more. Each page has sugested notes for soloing, so your solo will always fit with the other players. 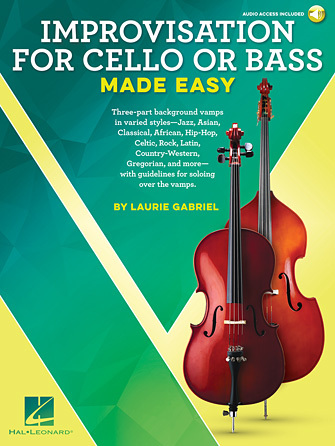 These volumes are available for four instruments – violin, viola, and cello/string bass – so string players can improvise together.